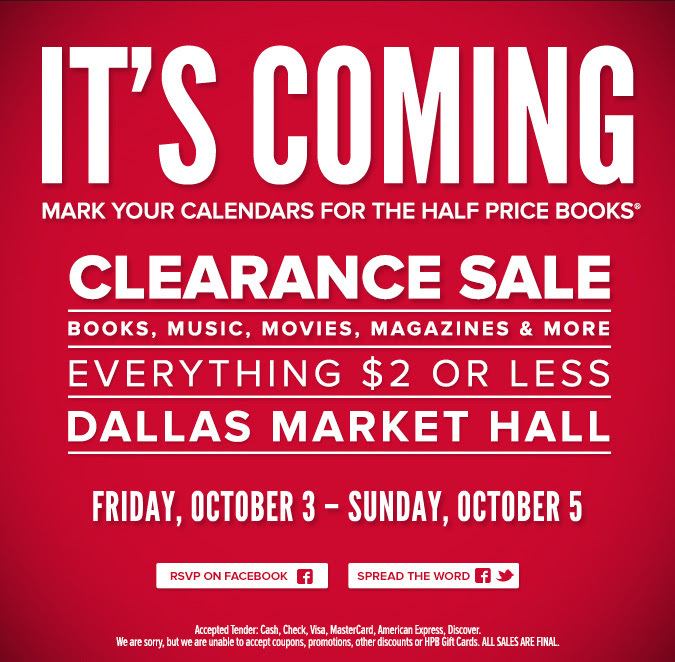 If the hope of fall weather is making you want to curl up with a good book, you might first want to head over to Half Price Books’ huge DFW-wide clearance sale at Dallas Market Hall this weekend. Everything at the clearance sale will be $2! Choose from thousands of books from almost every genre, CDs, audio books, children’s books, magazines and gift items. This gigantic sale covers over 100,000 square feet at Dallas Market Hall with restocking daily. What: Click here to learn more. Please be sure to pass this along to any teachers you know who might benefit from the extra savings for their classrooms. This entry was posted in Books and Magazines, Cheap, Dallas, Fort Worth, TX, Stretch your Dollar! and tagged Cheap, Fort Worth, Fort Worth Blog, Half Price Books, Half Price Books Fort Worth. Bookmark the permalink.